Hailed as “a phenomenon” who “pulls together the most intellectually enticing and emotionally gripping [performances] in New York” (The New Yorker), Robert Spano leads his Atlanta Symphony Orchestra in a stirring performance of Britten’s towering masterpiece. The composer created this mammoth meditation against war by juxtaposing Latin texts from the Mass for the Dead with shocking depictions of battle by Wilfred Owen, a British poet who died in World War I. The cathedral in Coventry was almost entirely destroyed during a German air raid in 1940, with only the outer walls, bell tower and tomb of the first bishop remaining intact. These were preserved as a memorial. In the 1950s, the decision was made to incorporate the ruins in a new building. The first stone was laid by Queen Elizabeth II in 1956. and the new cathedral opened on May 25, 1962. Five days later, it was musically inaugurated with Benjamin Britten’s War Requiem, in a performance broadcast live by the BBC. At the time, Britten was probably the only British composer able to strike a collective chord with his countrymen – even though in his operas, he always sided with eccentrics and outcasts. As a pacifist and homosexual, he had been personally familiar with the conflict between the individual and establishment since the 1930s. Yet Britten was not a political activist, for he was decidedly a member of a generation that held its peace when confronted with the dark aspects of community, family or the military. Artistically, however, Britten was an activist, as witness his antithetical heroes: Peter Grimes, Albert Herring, Billy Bud and Owen Wingrave. At times, his political message was so encoded that it seemed like a message in a bottle for a better future. 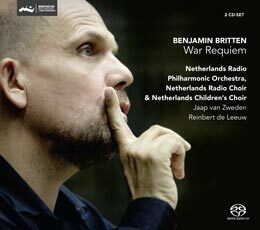 Britten’s musical protest to war is very profound and impressive and a memorable concert of this piece took place in the Concertgebouw in Amsterdam in May 2011. This was recorded on Challenge Classics with Jaap van Zweden and the Netherlands Radio Philharmonic Orchestra. A performance of world class!